This still image taken from a Sept. 21, 2010 video shows a blazing fireball over New Mexico as seen by a camera operated by radio astronomer Thomas Ashcraft. A brilliant fireball lit up the night sky above parts ofNew Mexico and Texas this week in a fiery display recorded by a skywatchingcamera. The fireball, thought to be created by a small spacerock, occurred Tuesday night (Sept. 21) at about 11:01 p.m. EDT (0301 GMT) andwas captured in a video camera as the meteor carved its fiery trail across thesky. It lasted 23 seconds and covered parts of New Mexico and west Texas,according to the website Spaceweather.com. [Videoof the Sept. 21 fireball.]? 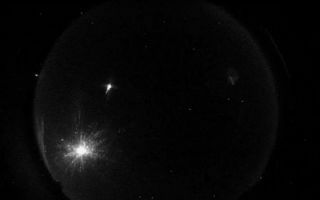 "I was inside at the time, but heard and felt thesonic boom," said radio astronomer Thomas Ashcraft, who operates theall-sky camera 20 miles (32 km) outside of Santa Fe, NM that recorded thefireball as it flew overhead. At first, Ashcraft thought the sound was thunder, but nostorms were expected. Then a phone call inquiry led him to check his camera'sdata, where he saw "a spectacular meteor occurrence." "At first I thought that this might have been spacejunk or satellite debris re-entering the Earth'satmosphere due to the low speed," Ashcraft told SPACE.com in an e-mail. "But upon further analysis, I am pretty sure this was a natural meteoricevent, possibly asteroidal." According to the skywatching website Spaceweather.com,the fireball prompted many calls to a TV news station in Albuquerque, NM, amongother reports. Ashcraft said some witnesses? described the fireball as"white and shedding sparks," blazing "like a firework," orshining bright with red and yellow colors. "It was not quite as bright as the moon,"Ashcraft said. The moon appears as a bright, unmoving disc in the fireball video. But the fireball was still dazzling, and is one the topthree events Ashcraft has recorded in the last four years. "A fireball this size only happens once or twice peryear over one observing location," he said. Meteorfireballs are fallen debris from comets or other space rocks. Asthe debris hits Earth's atmosphere, it heats up and produces the brilliantstreaks of light which we sometimes call shooting stars.Though most meteors are destroyed during this process, some make it to theground and are known as meteorites. Many bright fireballs go unrecorded and often evencompletely unnoticed because they fall over remote areas or over the oceans(and Earth?s surface is about three-quarters oean). Ashcraft uses an experimental camera on loan from SandiaNational Laboratories in New Mexico. The Sentinel all-sky camera is anear-infrared low light video camera outfitted with a fish-eye lens. It canobserve fireballs that occur anywhere within a 350-mile (563-km radius).Ashcraft has added a forward scatter radio meteor array to the camera, whichcan sometimes pick up sounds. "If you listen closely to this fireball you will beable to hear some sound, though it is subtle," he said.